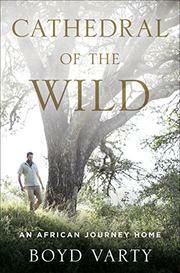 Scion of a South African wildlife preserve recounts somewhat canned yet poignant memories of growing up in the wild. Purchased in 1926 by Varty’s great-grandfather as a hunting ground for lions, the vast tract of lowveld adjacent to Kruger National Park evolved into a sustainable wildlife preserve by the mid-1970s, under the care of the author’s father, mother and uncle. Londolozi would “partner with the land” and work alongside the native Shangaan in order to bring back the great creatures, like leopards and elephants, that had abandoned the land due to cattle overgrazing and grass erosion. While Varty’s father and uncle built a fledgling business offering eco-tracking tours and his mother ran the administrative office, the young author and his sister, Bronwyn, received a terrific and rather charming, if occasionally hair-raising, education in the bush, chaperoned by their Shangaan nanny. They learned to drive the Land Rover by age 8 and made friends with the dazzling menagerie living among them, including bushbucks, agama lizards, francolins, hyenas and baboons. Bored of ecotourism, Uncle John became a successful filmmaker, and the author often accompanied his revered uncle on shoots making wildlife documentaries, one of which became a wildly popular series for kids, Bush School, featuring his own mother as the teacher and star. A visit to Londolozi from Nelson Mandela in 1990 is a highlight, as was Varty’s accompanying his uncle to film the migration of the wildebeest across the Serengeti, while some of the horrors included contracting malaria, getting held up in their Johannesburg home by knifepoint and being bitten by a crocodile. The final chapters chronicle the author’s youthful, inchoate “seeking” in India and Arizona, until, by his late 20s, he recognized that Londolozi was home. He’s no Isak Dinesen, but Varty writes for a stirring cause.